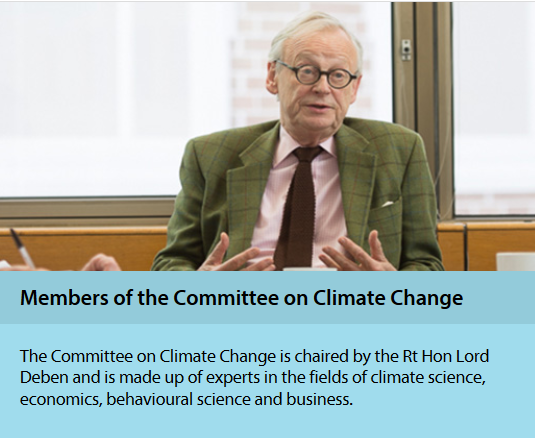 While John Gummer took £600k from green companies that stand to benefit from his advice to government, he is not the only member of the CCC who has a vested interest in climate alarmism and can hardly fulfil the Committee’s stated role of providing independent advice. 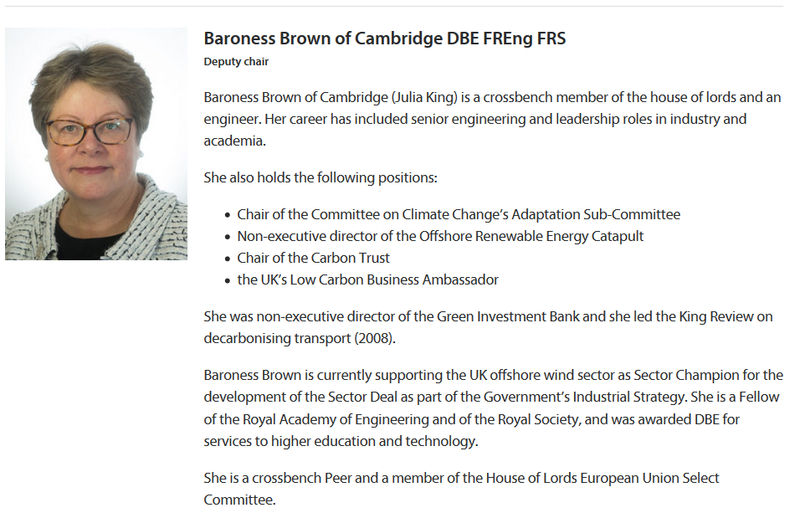 Brown, an engineer by background, is up to her neck in work for low carbon, renewable and green related organisations. It is hard to see how she can have any sort of independent or objective view on climate change matters. One position that sticks out is her directorship of the Offshore Renewable Energy Catapult (OREC), a company established by the government, and limited by guarantee. Nick Chater is an interesting one, as he has no background at all in climate change that I can see. Nick is Professor of Behavioural Science at Warwick Business School. He has over 200 publications and four national awards. He is a Fellow of the British Academy. Nick is on the advisory board of the Cabinet Office’s Behavioural Insight Team, also known as the ‘Nudge Unit’, and is the resident expert on Radio 4’s ‘Human Zoo’. Social purpose company! Heaven help us all. I think that original nickname of the Nudge Unit says it all. The whole purpose of the BIT is to persuade us plebs that what the government wants us to have is actually good for us. And it appears that Chater’s role with the CCC is exactly the same. How dare with serfs object to paying hundreds of pounds a year each, just to satisfy our Lords’ and Masters’ green obsession! We must be brainwashed to correct our unsocial attitudes! If that is not bad enough, we serfs are actually paying him for the privilege. It was, of course, the Priestley Centre which recently helped write that shamelessly dishonest paper, Recipe for Disaster, which purported to show that Britain’s fruit and veg industry was at risk from climate change. That alone should see him barred from any influence on public policy. This is the same Drax who would be bankrupt without annual subsidies from bill payers of £700m. Le Quere is former director of the Tyndall Centre, for which she still works as a Research Centre member. The Tyndall Centre is regarded as extreme, even by climate science standards. As with Piers Forster, she has spent so long working in the climate science industry that she can no longer claim to be objective or to see the wider picture. Skea is a founding member of the CCC, and is another who has long been involved with climate governance, including being Co-Chair of an IPCC working group. Most recently, he was co-author of the alarmist IPCC Special Report on Global Warming of 1.5 °C, which was widely regarded as a work of fantasy. The Committee on Climate Change is stocked full of fully paid up, card carrying members of the climate industry elite. They have been so bound up in climate alarmism for so long, that their views must now be set in stone, and they are unable to see the wider picture. Their fanaticism certainly makes it nigh impossible for them to admit that they might be wrong, or that there might be a better way. The CCC is supposed to offer independent advice to government on building a low-carbon economy and preparing for climate change, but this is plainly not possible given its current set up. ← Can Grid-Scale Storage Solve The Intermittency Problem? The name says it all. How can a ‘Committee on Climate Change’ possibly provide any other advice than the approved group-think endemic among supporters of the climate change fairy tale. Who needs scientific evidence?! No more independent than a General staff in wartime. Enough info now to end it all, for UK at least and, for all it matters, the rest of the world. Whether a vast hoax or misunderstanding, no use now to continue: a false alarm, but who can enact a permanent truce, Nature having won! NO NO Dave – you are thinking they actually mean what they say. There is no doubt that Private Frazer was correct. The trough is vast and the swamp is too big. Who is responsible for choosing the committee? Quite likely Michael Gove, who has just appointed Tony Juniper as head of Natural England. I’m just waiting for the announcement that George Monbiot (re-wilding for dummies), has been appointed as his deputy. Well in light of how politicians and their quango have performed in this area especially can anyone be actually surprised.? Drain the swamp? The CCC would be a very good place to start..
Prof Nick Chater is no doubt applying neurolinguistic programming to his job in the Behavioural Change unit and I wonder if he is a Common Purpose graduate. We mistake the purpose of the Committee . It is a committee FOR Climate Change and is therefor appropriately constituted notwithstanding the academic preponderance. .
Just as the IPCC is tasked to show how human activity causes global warming while duping the dumb into thinking it is a source of excellence. We need another Oliver Cromwell or a good does of ‘Trump’ to sort it all out. Another excellent investigative ‘enlightenment’ piece Paul … thanks for even more education. Nookie factor : You need to look at their family & other factors. I expect you’ll find the same groupthink web when you check the rest of their families. Drax corp is the UK’s biggest direct beneficiary of UK Climate policy isn’t it ? I like Marc Morano’s response! Ah yes.. the best “science” BPS can buy. It’s at least as scientific as the recent US national climate assessment.